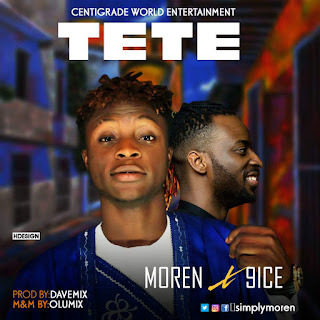 The centigrade company in collaboration with Alapomeji Records presents a new song from Moren, a neophyte and young contender in the music industry featuring living legend and living things crooner, 9ice. The much anticipated sonorous creation is now available for your auditory consumption, satisfaction and fulfillment. The track reviewed and given a 4.5 rating from prominent record producer Lahlah was produced by Davemix and mastered by Olumix. This doesn’t come as a surprise considering that Moren’s enviable talent and hard work landed him his centigrade deal and collaboration with 9ice with the legend tagging the artiste as “young, daring and creative”. Tete urges for an emergent grant of our daily supplications so one can enjoy and have the best times of life. The track already pon repeat on my playlist is a must have on yours. Be the first to hear the next trending sound. Available for stream and download on every media close to you.